This fabulous old country manor house, now a renovated hotel is deep in the countryside and approached by a 4 km long rough road with all-round views and the beginnings of the wild flower display were already showing some colour on my visit on a wet, grey day at the end of April. The road snakes and winds passed wheat fields and olive groves, there are plenty of signs reassuring you that you are going the right way. Suddenly a rooftop and buildings come into sight, a ramshackle collection of barns in some state of dilapidation but go around the corner, park your car and enter the large wooden gates and the welcoming courtyard with restaurant, chapel and hotel sits charmingly within its walls. Take solitude in the chapel, relax in the sun, read the by the pool or take tea by the log fires in winter. 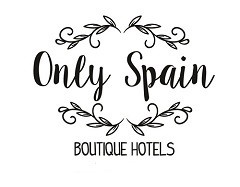 For a special retreat, far from the maddening crowds, this is just the place to return to after a day in Granada (20km away) or drive around the beautiful countryside. All ten bedrooms are unique, many original features have been retained and reused giving the once abandoned cortijo a fabulous new life and its guests with a fascinating historical record. Read our Blog Post Five Fabulous Hotels for Great Walking Holidays in Andalucia which features Cortijo del Marques.